Comments: Marjorie (Harris) Fry holds her daughter, Marjorie Helen Fry, in the above photo. 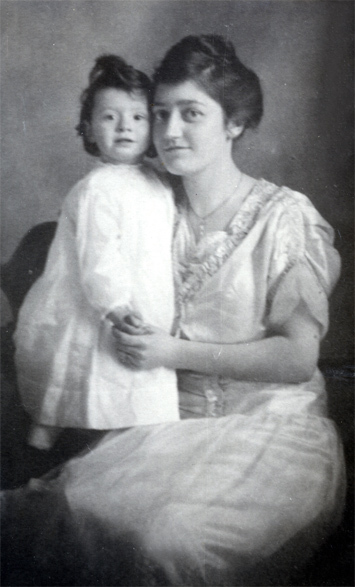 Marjorie Harris was born July 19, 1889, in Scottsville and was the daughter of Charles Bascom Harris, Sr., and Helen Goddin (Crafton) Harris of Scottsville. She was very musical and at age 13, Marjorie was drafted by Henry Hartwell Gary Harris, her uncle and the choir master, to serve as organist for the Scottsville Methodist Church. On October 4, 1912, Marjorie married George Washington Fry at the Scottsville Methodist Church. After their wedding, the Frys are shown standing at the trunk's right in this photo as they departed from Scottsville's C&O Depot for Oklahoma. George graduated from Lawrence College in Appleton, Wisconsin, with an engineering degree in 1905. He spent several years surveying for western railroads and then attended the University of Virginia's law school where he was awarded a law degree in 1910. George Fry began a law practice in Oklahoma City, Oklahoma, and later became Vice President and General Manager of West Texas Utilities. The Frys were the parents of two daughters: Mary Stelle Fry (1917-1946) and Marjorie Helen Fry (1913-1991, shown in top photo). 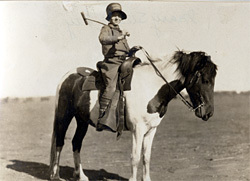 At left, Mary Stelle is shown riding her pony in this circa 1927 photo. Marjorie (Harris) Fry died in 1983. 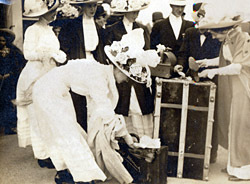 These photos are part of the Katherine Ellis collection. Katherine resides in Scottsville and is the granddaughter of Charles Bascom Harris, Sr., and Helen Goddin (Crafton) Harris of Scottsville. Katherine is the niece of Marjorie (Harris) Fry.